Bathroom fans are great. Half-baths have one great reason to have one, and bathrooms with showers have two. First of all, if you’re in the market for a bathroom fan — granted, not a frequently purchased item for most — you should definitely consider the Panasonic WhisperCeiling. It’s much quieter than any other household bathroom fan I’ve ever heard. I got an 80 CFM for a half-bath and 110 CFM for a full-bath, although I think the 80 would have been sufficient for both and it’s significantly quieter than the 110. The problem with bathroom fans is that they’re inconvenient to use: ideally, you want the fan to run for a little while after you leave the bathroom. If you turn it off when you leave, it’s not very effective, and if you leave it running, you’ll probably forget about it for hours and waste tons of electricity. It may even be a fire risk. A timer switch fixes this problem. After convincing my skeptical wife to let me install them, she only had two criteria: they couldn’t be the old giant-knob style, and they had to look good. They both work. (Exciting.) But beyond that, they’re very different. The Lutron looks nicer, but in use, it’s more complicated: the small rocker on the right side selects the duration from the numbers on the left, and the giant center button is the on/off switch. The currently-selected time LED glows constantly, even when off. When on, the LEDs pulse down sequentially from the selected time to the bottom in a cycling animation, starting lower as the remaining time nears zero. It’s visually and conceptually busy and overly complicated. The Leviton is simpler: just tap the time you want, and its LED glows. If you tapped “30M” but there are only 20 minutes left, only the “20M” LED will glow, and so on. When off, the bottom-center LED glows orange. If you change your mind about the time when it’s on, just tap a different duration. To lock it on, hold down one of the time buttons for a few seconds, and the bottom LED glows green. Visitors have been confused by both. Many have figured out the Leviton, but none have successfully used the Lutron — even a contractor working on the bathroom was scared to touch the Lutron and asked me how to turn the fan on. 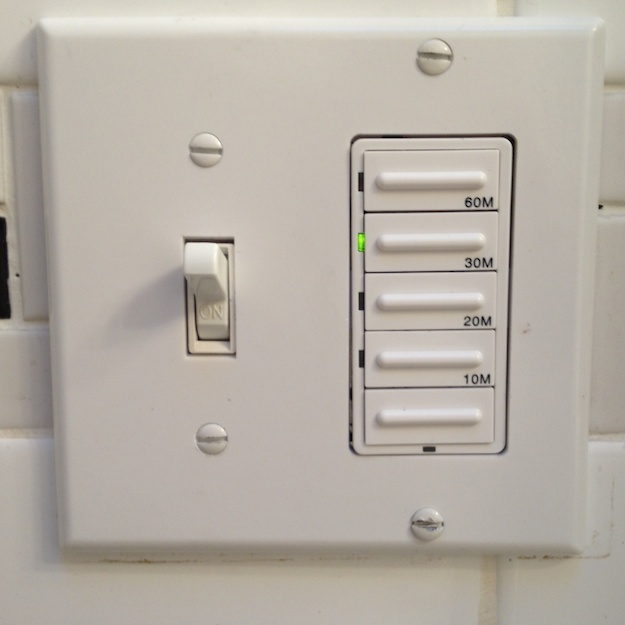 The Lutron is also more work if you often choose different durations. After a shower, you probably want the full hour to clear out the humidity, but after ruining the air in a half-bath, you probably only need 15–20 minutes of runtime. 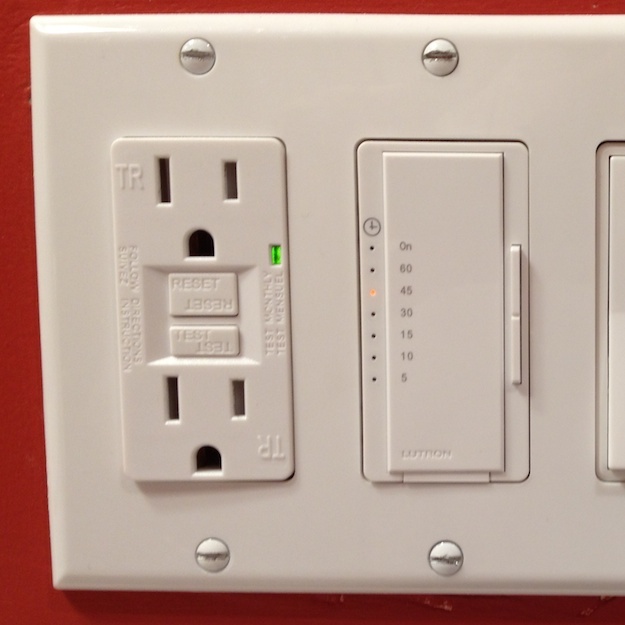 With the Leviton, you just tap the button for whatever duration you want each time. With the Lutron, you’re effectively using a menu to change the duration whenever it’s not the same as the previous selection. The difference between them isn’t big enough for me to replace either with the other model, but the Leviton is definitely my favorite. My formerly skeptical wife loves it, and is now convinced of the value of bathroom fan timers.